I'm a fan of both "Bridget Jones's Diary" and "My Big Fat Greek Wedding." 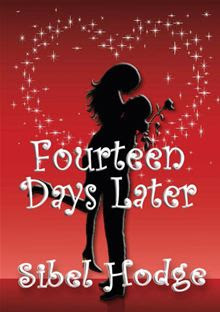 When I was told that "Fourteen Days Later," by Sibel Hodge, was like a marriage of the two stories, I knew it was something I'd have to check out. What I got in return was a charming and adorable story with an unforgettable heroine! Helen Grey has been pining after her ex-boyfriend for about six months when her best friend, Ayshe, decides to put her on a 14-day plan to get over him once and for all. Her plan forces Helen out of her house--and out of her element--teaching her more about herself than she ever thought possible, and even allowing for a possibility of romance in her life. I really liked the concept of this novel. It makes me wonder if anyone actually has been part of a 14-day plan or designed such a plan for someone else. I don't know that the plan was all too structured in the beginning, as it had Helen running around all over the place and doing crazy things without a sense of purpose. As Helen became more confident, her plan got even more interesting and I couldn't wait to see what was in store each day. Then there was the factor of her romantic interest, whom I really liked, even though his behaviors were hard to predict sometimes. (And since I watch "Smash," I picture Raza Jaffrey a.k.a. Dev playing him in a movie version.) There were a lot of funny moments, thanks to Helen being klutzier than Susan from "Desperate Housewives." She even made me feel graceful in comparison! She was an endearing character and I found myself rooting for her at her good moments and getting all frustrated when things didn't go her way. There were, however, some things that didn't work as well for this novel. I wouldn't have minded if the obscure British name drops had some explanation to them, so I wasn't sitting and wondering who Helen was referencing each time. The dialogue tended to get awkward and sound forced at times, which made the humor seem forced in that respect. (I did laugh out loud plenty of times, but after a while, Helen's embarrassing moments seemed a bit over the top.) I liked the cultural rituals in preparation for Ayshe's wedding, but I would have loved some background about why they were done. I'm not that familiar with the Turkish Cypriot culture and beliefs. Finally, it was sometimes tough to keep track of characters. A character would be mentioned early in the story and then not appear again until much later. It took me some time to remember who they were. After that point, Ms. Hodge kept them in the story more often and they added to the humorous moments. Since I had "Fourteen Days Later" on my Kindle for PC, I was mainly reading it in the mornings (as my breakfast book), but it definitely gave me something to look forward to after getting myself and my kids ready for the day. I genuinely wanted to know what was going to happen for Helen each day of her plan and I even got misty-eyed by the end. It was a sweet story that reminded me exactly why chick lit is still alive and stronger than ever.